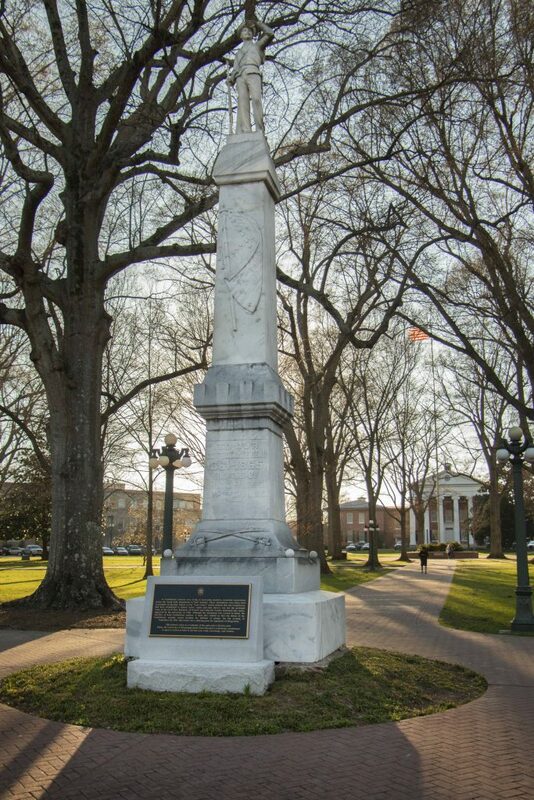 Interim Chancellor Larry Sparks said the Confederate monument that currently stands in the heart of the Ole Miss campus should be relocated “to a more suitable location” in a statement sent to students and faculty on Thursday. Sparks will now have to get permission from the Mississippi Institutions for Higher Learning and the Mississippi Department of Archives and History to relocate the statue. The IHL Board of Trustees must approve of the recommendation to relocate the statue, and their next meeting is scheduled for April. However, the chancellor did not say in his statement when he will recommend the action to IHL. Sparks said the university has submitted a “notice of intent” to the Mississippi Department of Archives and History to gain approval to relocate the statue. In a previous statement to The Daily Mississippian, Michael Morris, the public information officer for the department of archives and history, said the Circle at the university was designated as a state landmark in 2011, which, under the state’s Antiquities Law, means the university must obtain a permit from the department before altering a landmark. This announcement comes after all four campus government groups — the Associated Student Body, the Senate of the Faculty, the Graduate Student Council and the Staff Council — passed resolutions calling for the relocation. ASB President Elam Miller said he is proud of the chancellor for moving forward with the process of moving the statue out of the Circle. Black Student Union President Jarvis Benson said he sees the administration’s continuation of efforts to remove the Confederate statue from the center of campus as a demonstration of the power of student voices. The authors of the campus government resolutions that led to Sparks’s decision are also responding to the chancellor’s chosen course of action with praise. Faculty senate chair Brice Noonan said he was impressed with the speed with which the university has addressed the statue this academic year. “This was a refreshingly timely and clear response to the statements issued by the (university) representative bodies that demonstrates the administration’s commitment to working with and listening to the members of our campus community,” Noonan said. Staff Council President Gazel Giles said she was pleased to hear that Sparks is in agreement with the campus government organizations and most upper-level administration that the statue needs to be moved. Many alumni and community members took to social media with their reactions, which appeared to be mostly negative. “Do we get a vote in that?” and, “All we ever do is give in,” were among the comments university alumna Hunter Stewart posted to Facebook in response to Sparks’s announcement. Some comments mentioned frustration with the administration’s decision to begin the process of relocation, and others shared their relief and excitement. While the four resolutions specify the Confederate cemetery near the Tad Smith Coliseum as the most appropriate location for the statue, Sparks’s statement did not clarify the location to which the statue will be moved. Interim Chancellor Larry Sparks announced that he will continue the process of relocating the Confederate monument that currently resides in the Circle. Photo by Katherine Butler.